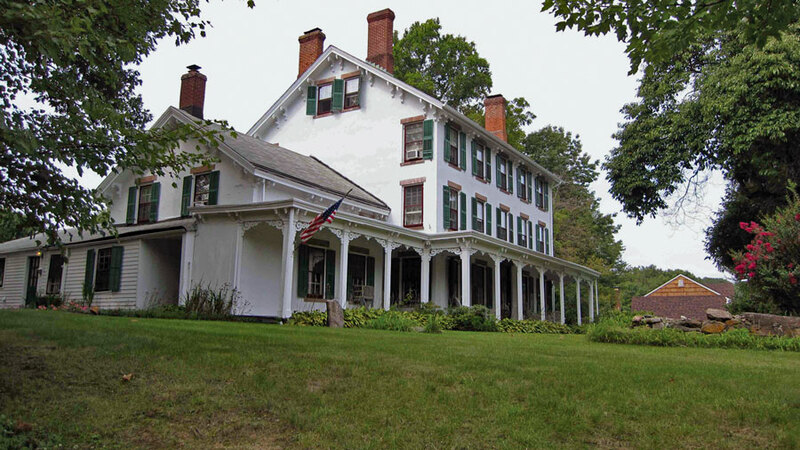 The Ford House (1857), on the site of the original family homestead dating from 1715 in Hanover Township, was built using multi-story concrete wall construction. 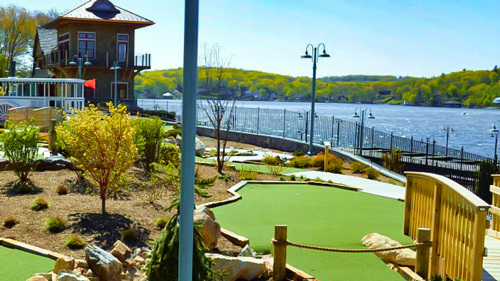 Scholarship reveals the area was named by the Native American Lenne Lenape people Whiponong, where the river met what was then the Dutch trade route known as the Minnisink Trail (precursor to the road that became first the Dover Turnpike, and later Mount Pleasant Avenue). There's disagreement about the identifier that precedes "nong" or, "place" in the Lenne Lenape language; and is translated as "arrow wood", or by scholars of the early 20th century, "willow trees" for the common Black Willow, salix nigra. Their wood recognized for its resistance to splintering when nailed, the trees were plentiful throughout the area surrounding the river, although the nearby marshes of Lee, Troy, and Black Meadows also provided vast stands of reeds that could have been the inspiration of the name. Hanover's original European settlements coalesced around village communities that named themselves Monroe, after Morristown resident, Governor of Virginia, and fifth president of the United States, James Monroe, to the south end of the Township; and Malapardis (from the Lenne Lenape word malapahus, or, "place of the poor flint" nearer to the Minnisink Trail to the north. But these communities receded as the enterprises of the forging of iron, mined from the hills nearby to the north and west, and the fabrication of paper, were established along the river in the early eighteenth century. Agricultural production, then brick, iron, and paper fabrication all needed transport, and in the late nineteenth century was provided by the Whippany River Railroad Company, which built a connecting line to the Delaware, Lackawanna & Western rail system in Morristown. Later, after the purchase of the company by a prominent local businessman Robert McEwan, the Whippany and Passaic River Railroad was formed by the McEwan family, and a branch of the railroad was built out to the east, connecting to the Erie rail system in Essex Fells. In August, 1903, the two railroads were consolidated into the Morristown & Erie Railroad, which survives to this day. As a center of industry, and a connecting line between two large rail systems, Whippany Station became a busy location along a still very rural Mount Pleasant Avenue. That location today is the site of the Whippany Railway Museum, at the junction of State Route 10 and Whippany Road. After the ascendancy of motor transport, much of the railroad's lines fell out of regular use, and modest amount of rail traffic revived briefly out of the Whippany station in the 1960s as a tourist railroad. 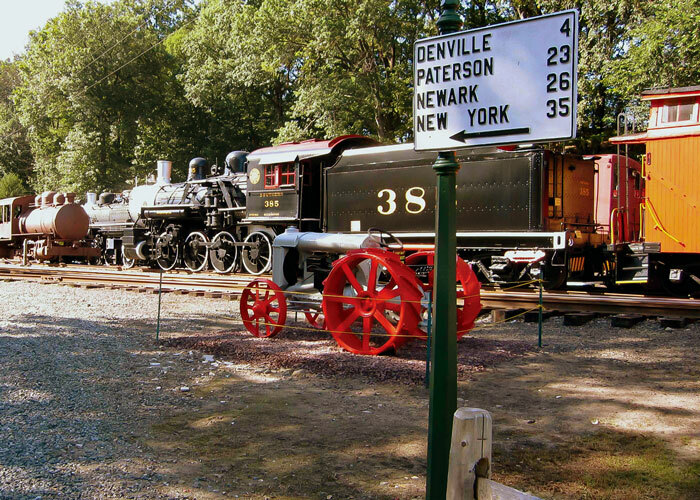 The Museum is dedicated to "preserving the heritage and history of the railroads of New Jersey, through restoration, preservation, interpretation, and operation of historic railroad equipment and artifacts". There are fifteen core rail equipment pieces in the museum's collection, ranging from handcars to cabooses and passenger rail cars, to steam and diesel locomotives. Several other pieces of equipment are parked at the yard, awaiting their turn at restoration. Prominent in the yard at Whippany is the distinctive water tank that dates from 1904, and is one of the few steam-era water tanks in America still in its original location. Found on both state and national registries of historic places, the tank is also on Morris County's list of most endangered historic sites, and is awaiting restoration funding. The Whippany Railway Museum is open on Sundays only, through the end of October, from noon to 4:00 pm. Visitors to the Museum yard are warned that the rail line is active, and that while enjoying proximity to the equipment and architecture, "anytime is train time." There remain some attractive examples of home and church design from Hanover's past. In the old village of Monroe, the Demas Ford house (c. 1760) at the corner of Cedar Knolls Road and Whippany Road, and the Burnett House at the corner of Whippany Road and Fieldstone Drive still stand. 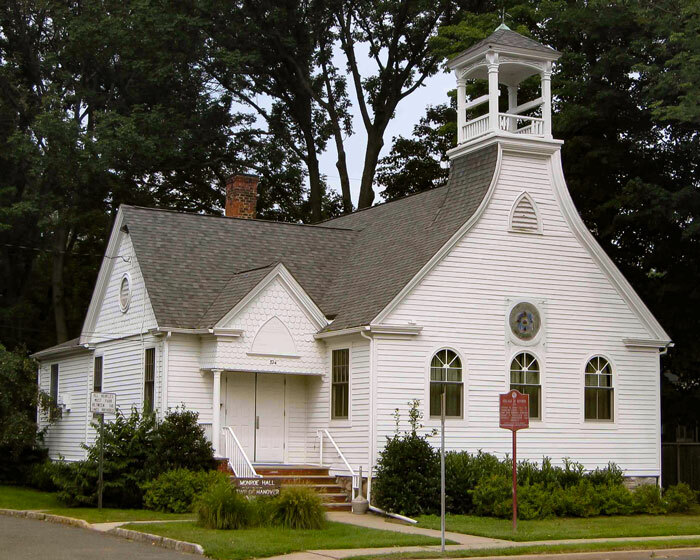 Built by Hanover's Methodist community the striking, graceful lines of the Monroe Union Chapel (1894) can be seen on Whippany Road. In the former village of Malapardis, the Fanok House, familiar to travelers on the dirt road that was then Mount Pleasant Avenue, remains but is likely to disappear with road improvements to Route 10 near the intersection with I-287. Monroe Union Chapel (1894), now a municipal property, Hanover Township. Perhaps the most interesting example of residential architecture in Hanover, the 1857 Ford family house on Ford Hill Road. From an original settlement in 1715 by founding patriarch John Ford (d. 1722), the Ford House seen today was built just prior to the Civil War, and is a striking example of grand early Victorian style. The first homestead was established on a hillside above Black Meadows, the current location of the Morristown Municipal Airport. The Morristown airport, the third largest in NJ and relief field for Newark Liberty International airport (seventeen miles distant), is a busy corporate jet hub, and contributor of almost a quarter of a billion dollars in economic activity in the region every year. 637 acres of the Township's Black Meadow were filled to establish the buildings, and taxiways, and north-south runway 5/23 (6,000 feet), and east-west runway 13/31(4,000 feet). MMU, the field's IATA (International Air Transport Association) and FAA Location Identifier, is a vast tract at the south western limit of the town, owned by the Town of Morristown, and sees more than a quarter of a million landings and takeoffs per year (recently the second busiest airport in New Jersey). The field serves rotary and fixed wing aircraft, and is the frequent destination of corporate flights serving the pharmaceutical, telecommunications, and financial industries, and with the New York Football Jets' training facility just a few hundred yards away in the Borough of Florham Park, professional sports. Lately, presidential arrivals for retreats to nearby Bedminster serve as spectacle at the airport, but mostly inconvience for surrounding air services which must cease doing business during those times. Thanks to local historian, environmental steward, preservationist and Hanover Township Mayor Leonardo Fariello for his help in the preparation of this article. His history of Hanover Township "A Place Called Whippany" (2006) is available from Len Sunchild Publishing.